The 1-Series M Coupe has been hailed by the press as the savior of the M car. In an era when each generation of the M3 comes with more and more luxury accoutrements and electronic toys, many feared that the M car was getting too far away from its stripped-down performance roots. The 1-Series M Coupe is everything that the M-philes want it to be, small, light, powerful and without too much to distract you from the task at hand. This extra performance comes at a premium, but it isn’t exactly cheap coming from any of its competitors either. There are some cars that BMW was simply made to build. Others, such as their foray into Sport Activity Vehicles (SAVs), are nothing more than a need to add to their bottom-line. In short, BMW&apos;s new 1-Series M Coupe is a masterpiece of automotive engineering and performance, whereas, say the X6, is just leather seats and GPS wrapped in a cheap suit. After plenty of teaser images, it&apos;s about time that BMW made everything official. Not only are there now official pictures, BMW has released all of the specs regarding their long-awaited pocket rocket. Powered by a 3.0-twin-turbocharged straight-six with 335 hp at 5,900 rpm and 332 lb-ft of torque, BMW has held nothing back. It goes from 0-60 mph in a blistering 4.7 seconds and the quarter mile in 13.2 seconds. Top speed is electronically limited by the ECU to 155 mph. A six-speed manual transmission driving the rear wheels through a variable M differential lock comes standard. In comparison to the 135i, not only is performance dramatically improved, but also the exterior receives a number of design changes. BMW has added flared fenders and rear quarter panels that are needed in order to cover a wheel track that&apos;s been increased by 2.8 inches in front and 1.8 inches out back. There&apos;s also a new front fascia with a wider central air intake that&apos;s covered by a honeycomb-like grille along with what BMW calls air curtains to allow high-pressure air to "curtain" the front wheels, thereby reducing turbulence. The rear fascia also features similar ducts, LED tail lights, and a lip spoiler fitted to the trunk. BMW has also added M3-style side mirrors that are wind-tunnel optimized. Other chassis upgrades include various other M3-sourced aluminum suspensions bits as well as a more powerful braking system with internally-vented, cross-drilled cast iron discs measuring 14.2-inches in diameter up front and 13.8 inches at the rear. In addition, the rack-and-pinion steering is fitted with Servotronic, which is a hydraulic power steering system that regulates boost in relation to road speed. The car also comes with a steering wheel-mounted M Drive button which adjusts the throttle response for sportier driving - an M car trademark feature. 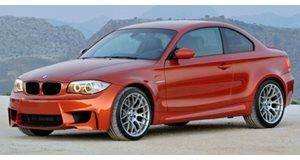 The new car rides on M-specific 19-inch silver light-weight alloy cross-spoke wheels that come from the M3 Competition Package and the M3 GTS. Overall, the car is 2.1 inches wider and half an inch taller than the standard car. There are only three exterior color choices: Alpine White non-metallic, Black Sapphire Metallic, and Valencia Orange Metallic, the latter being available exclusively on the 1-Series M Coupe only. The interior features the now-typical BMW upgrades for M models such as a sports steering wheel and leather seats. There&apos;s also other leather and Alcantara trim pieces with orange contrast stitching, and a restyled instrument panel. Final pricing hasn&apos;t been announced, but that along with other packages and options will become public when it goes on sale in limited numbers this spring. With the new 1-Series M Coupe, BMW reminds us that their enthusiast soul hasn&apos;t been corrupted by the arrival of their own SAV lineup. In fact, it&apos;s never been more pure. 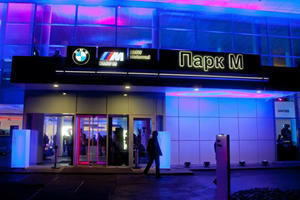 Russia’s second largest city is honored to house BMW’s second ever M exclusive showroom. 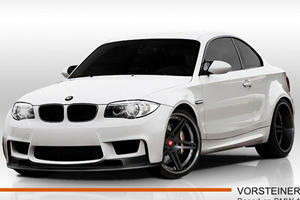 The BMW 1-Series M Coupe will be getting a nifty aftermarket program this January. 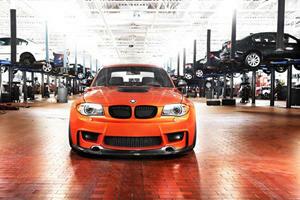 BMW M fanatic utilizes skills and mastery of IND to create a supreme BMW 1M.